In the Internet world, you can find Upholstered beds at any price and characterised by various models and quality. Here are the 7 key features of a VAMA Storage bed. We remind you, that all beds can also be realised in the Queen size and in the French one and, if the space of your bedroom requires a special dimension, we can produce a custom model. 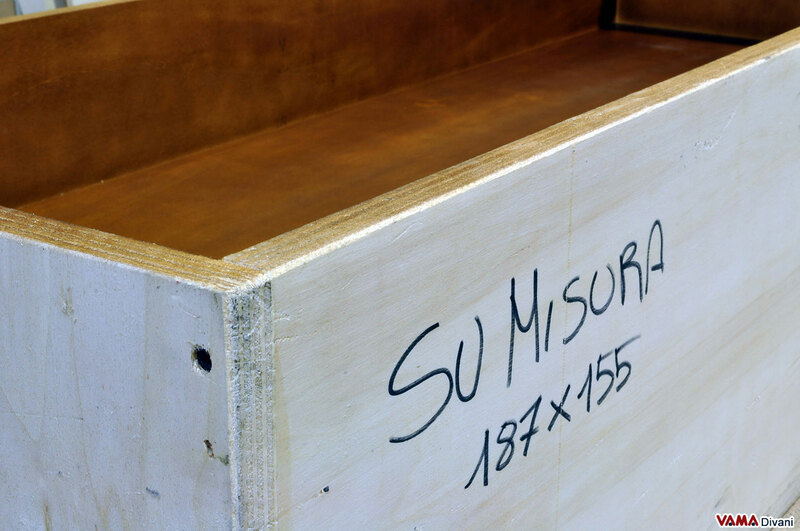 The raw material is essential to produce a high-quality Storage bed. To ensure that the bed is sturdy and long lasting, its structure has to be perfect and built with high-quality materials. To achieve this, VAMA Divani uses the 2 cm thick Poplar plywood in the whole structure, which is essential in order to withstand heavy loads, and to demonstrate the strength of our Storage Beds, we made this video, in which we want to highlight that in our storage boxes you can even jump in. In addition to being resistant thanks to its thickness, this material is very elastic, so it is practically impossible to break its structure, because it flexes if it is put under strain. The structure of a great piece of furniture must be solid and stable, without these two features it cannot be defined as a high-quality one. 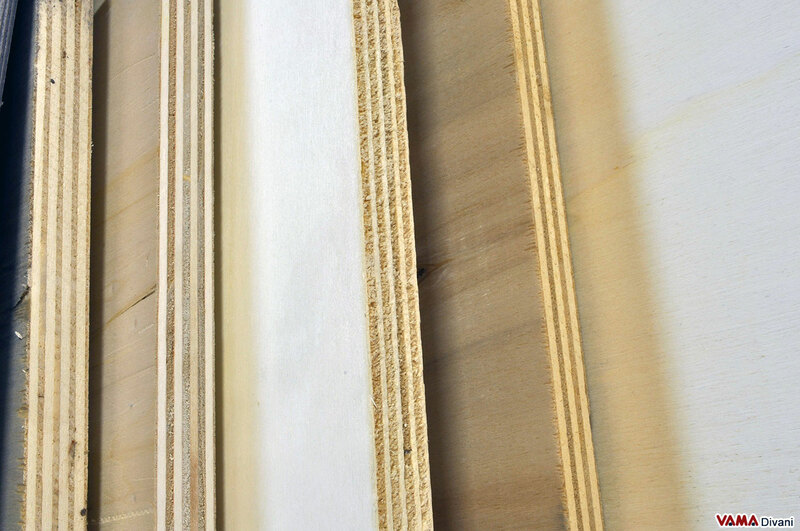 In our Storage beds, the frame is a whole element, this means that all the parts are fixed together by screws and wood glue, so that it becomes a single and strong block which can resist over time, so that the whole structure will react to the various stresses. After assembling the untreated wood, this structure is painted as a piece of furniture itself, so that even when we raise the slatted base of the storage bed, the quality and accuracy of the details remain equally perfect with the passage of time. The plates, the joints and the whole structure of our mechanisms for Storage Beds, are made of iron and coated with special paints to ensure that they do not rust over time. The pistons we use to ensure that the mechanism is active for the lifting of the slatted base, are gas pistons just like the rear doors of the cars. The piston force is calculated according to the size of the slatted base, in such a way that when the bed is closed, it is impossible that it opens automatically, and when we raise slightly the base, the mechanism is active and the person feels it effortless. Both mechanisms are anchored to the structure by means of bolts, not with simple screws screwed into the wood. This means that the mechanism will remain anchored permanently to the structure, and that it can withstand the highest stresses without moving or loosening from the structure itself. With the entire structure as described in the second paragraph and the mechanism fixed on it with this method, this causes the Storage Bed to become practically unalterable over time. 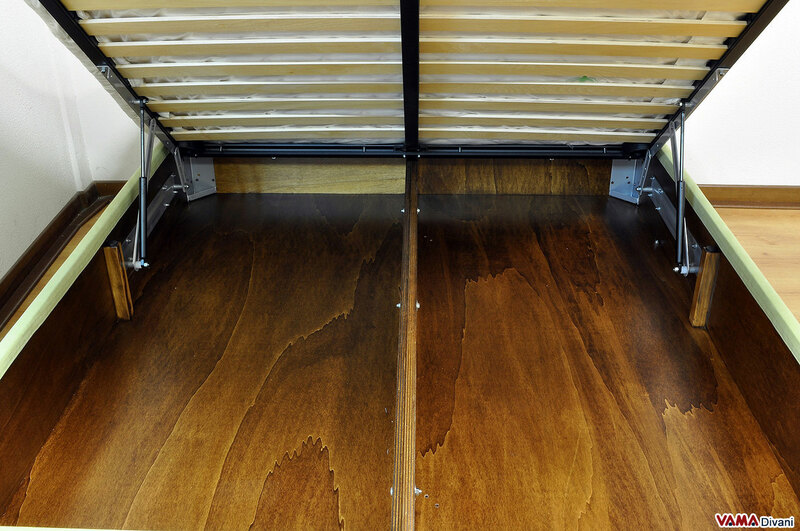 Like all our products, even our Storage Beds can be customised in any detail and size. You can require any feature and detail that you want to vary and change from our Standard Beds. These changes will not affect the quality of our Storage Beds, as the standards of strength and duration applied by VAMA Divani will always be respected. 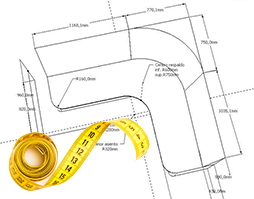 Length, width, height are only the main features that our customers usually ask us to change. Do you have a special size to follow? Have you to place the bed in a bedroom set with bridge wardrobe? Do you want a larger storage box with increased height? VAMA Divani will realise the perfect Custom Storage Bed for your bedroom. Other requests, instead, are based on personal tastes and special needs, such as the side opening of the Single Storage beds, increased padding, special feet colours... so, if you have special requests to make your own Custom Storage Bed, feel free to contact us. The removable cover is the main feature which must have a Storage bed to ensure that even the upholstery may have some cleaning operations, so as to remain unchanged over time. Removing the cover from your own Storage bed means removing the upholstery from the frame, so it can be washed in a washing machine as a piece of clothing. 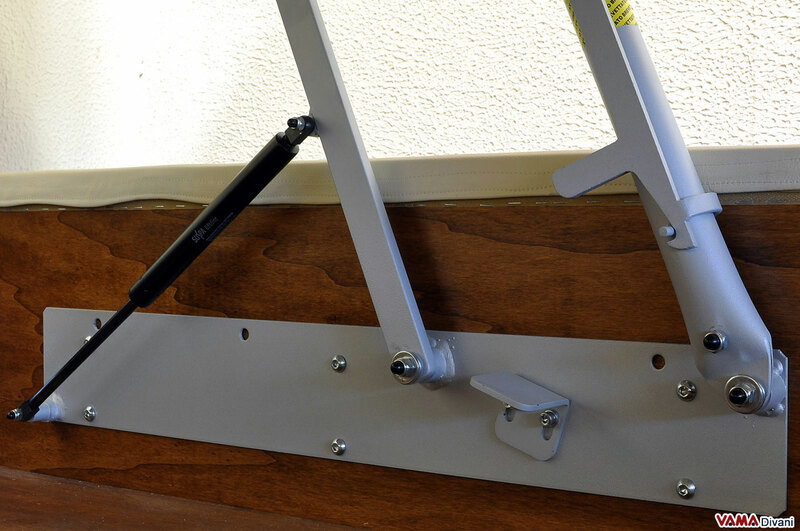 To equip a Storage bed with Removable Cover, we fix on its upholstery and on its frame, some Velcro straps, a fastening method which facilitates application and removal of the cover itself. 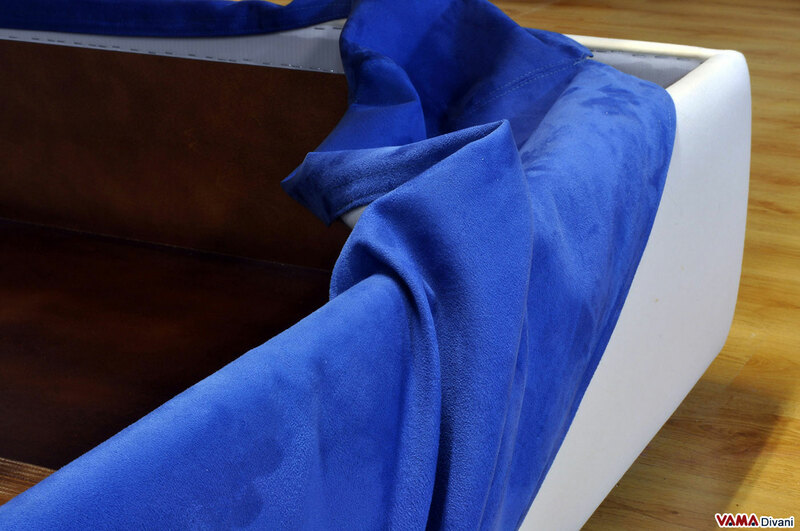 Even for Leather Storage beds, we use this type of cover fastening, but not for washing, only for convenience. For example, if in the future you want to change the colour or the type of upholstery chosen in the past, VAMA Divani can realise a second cover for your Sommier bed even after several years. Since 2008, the year of our first website, we arranged to meet purchase requests for Made in Italy products which come from all over the Europe thanks to specialised carriers for furniture items selected over the years. Shipping anywhere is not enough to say that you can enjoy a delivery of quality. Since we rely on external companies for this service when it is out of our reach to proceed with the delivery through our van, we have set to find a packaging method in which the Storage bed is delivered at the customer's home in the same condition that it was in the factory before being packed. In order to prevent possible damage caused during transport, we pack our Storage beds with three layers of material: the first layer in nylon, the middle layer in bubble wrap (air cap), and finally, with a reinforced cardboard box. This choice of packaging has allowed us not to receive any type of complaints from our customers since 2008 to present. "The best advertisement is completely meeting a customer's request". ​​This is the slogan that has been stimulating our Italian craftsmen for more than 30 years, to pay attention in every detail of our products, and it is for this reason that VAMA Divani can keep its customers even after 5, 15, 30 years. In addition to offering high-quality products, our commitment is also based in following the customer from the first contact to the delivery at home of his/her own Storage Bed, offering a daily availability, in case there were any doubts or uncertainties to be clarified. When the Storage Bed is at the customer's home, we always send an email where we ask a feedback, both about the product and the company's behaviour, so as to take note of negative factors in order to improve our service. All the feedbacks of our customers, both negative and positive ones, are published in the pages of our products, so as to show the transparency of our service to the new site visitors, and if the client gives us the approval, to increase the transparency, we publish, together with comments and feedbacks, the product pictures taken at home by the customer, so as to leave a true signature in our website as a VAMA Divani customer.